In addition to delivering great-sounding music, the Apple HomePod is a smart speaker that can perform tasks like controlling your smart home, giving you news and sports scores, and translating words into other languages. In order to take advantage of these smarts, you need to know the right commands. This article lists 134 of the most common, and most useful, HomePod skills (the specific functions or tasks supported by a smart speaker). Start each command listed here by saying "Hey Siri." Words listed in brackets below—[like this]—are variables that you can customize to your needs. HomePod can also recognize synonyms. For example, a command listed below as "set" should also work if you say "adjust." 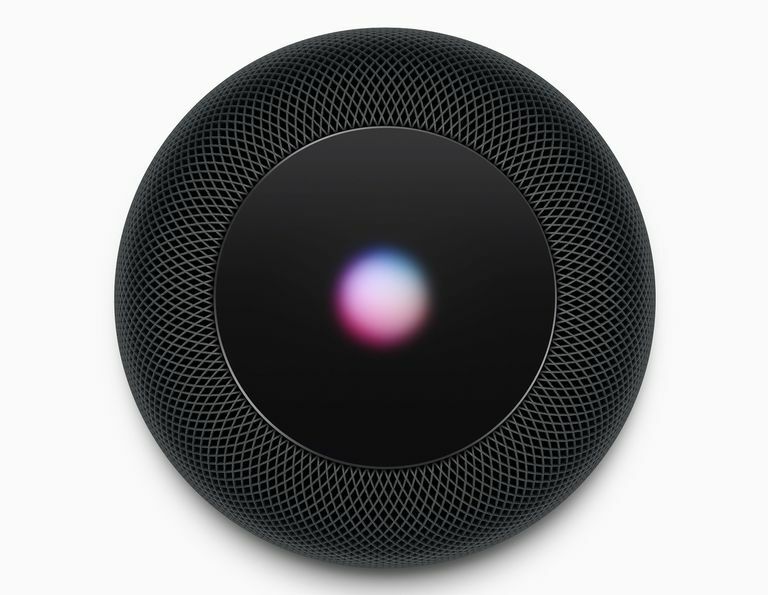 It's also important to know that HomePod only works with one user account—the one belonging to the iPhone used to set up the device in the first place. So, when you ask Siri to create a note or a reminder, they're created for just one iPhone/iCloud account. You can't change that without setting up HomePod with a new iPhone. Prefer to not have HomePod listening for commands? Just say, "Hey Siri, disable Siri." You can always turn back Siri on with a long press on top of the HomePod or in the Home app where you manage the device's settings. ​These commands control Apple Music only. To use streaming music services like Spotify, use AirPlay. "Play [song name]" or "Play [song name] by [artist name]"
"Play [album name]" or "Play [album name] by [artist name]"
"Play the latest [artist name] album"
"Play music by [artist name]"
"Play the top 10 [genre name] songs"
"Play songs from the [decade]"
"Play hit songs from the [decade]"
"Play the number 1 song from [date]"
"Play the [movie name] soundtrack"
"Add this song to [playlist name] playlist"
"Shuffle my [playlist name] playlist"
"Play a live version of this song"
"Who was the [drummer/guitarist/etc.] on this song?" "What is this song called?" "Add this song to my library"
"Play more songs like this"
"Never play [this song/song name] again"
"After this, play [song name]"
"Tell me more about this artist"
"Raise/lower the volume to [1-100]"
​These commands control the Apple Podcasts app only. If you prefer another podcasts app, you'll need to use AirPlay. "Play the [number] episode of [podcast name]"
"Play the newest episode of [podcast name]"
"Jump back [amount of time]"
"Skip ahead [amount of time]"
"Play it [speed; twice as fast, etc.]" "Create a radio station based on [artist name]"
"Play music that I like"
"Send a message to [contact name] [message content]"
"Send a message to [multiple contact names for group message] [message content]"
"Do I have any new messages?" "Read my messages from [contact name]"
"[chat app name] message [contact name] [message content]"
​Supported chat apps include Skype, Viber, WeChat, WhatsApp. App must be installed on your iPhone. These commands work only with Apple HomeKit-compatible smart-home devices. "Turn on the [device name; lights/fan/etc.]" "Turn off the [device name]"
"Turn on/off the [device name] in [room]"
"Set temperature in [room name] to [temperature]"
"Adjust lights to [desired brightness]"
"Set lights in [room] to [desired brightness]"
"Make the lights [color] in [room]"
"I'm [HomeKit scene name; home, leaving, etc.]" "Set my [scene name] scene"
"Are the lights on in [room]?" "Is the garage door open?" "What's the temperature in [room]"? "Turn off the [device name] in the [location] house"
"Set the temperature in [location] to [temperature]". "Add [item] to my [list name]"
"Remind me to [item] when I [location information; leave the house, get home, etc.]" "Do I have any reminders?" "Set a timer for [amount of time]"
"Change the timer to [time]"
"How much time is left on the timer?" "What time is in it [place]?" "Wake me up at [time]"
"Change my [time] alarm to [new time]"
"Set an alarm for [time]"
"Set an alarm for [time] on [day]"
"Set an alarm for [time] every [day/days]"
"Set an alarm for [time/day] titled [name]"
"What alarms do I have?" "Did [team name] win last night?" "What was the score of [team name]'s last game?" "When do [team name] play next?" "What teams are playing in [sporting event]?" "What [sport/league] games are happening today?" "How many [points/touchdowns/home runs/other statistic] did [player name] have yesterday?" "Will I need an umbrella today?" "What's the weather forecast tomorrow?" "What's the weather in [location name]?" When does the sun rise in [location name]?" "Create a new note called [title]"
"Add [content] to my [note title] note"
"Create a new [note app name] note called [title]"
Add [content] to my [note app name] [title]"
Supported notes apps include Evernote, OmniFocus, Picniic, Remember The Milk, Streaks, and Things. App must be installed on your iPhone. "How many [unit] are in a [unit]?" For example: "How many teaspoons in a tablespoon?" "How many calories are in [amount] of [food]?" "What's the traffic like on the way to work?" "How long does it take to drive to [location]?" "What's the latest sports news?" Choose your preferred news source by asking HomePod to "change the news source to [name]." NPR News is the default, but other options include CNN, Fox, and the Washington Post (In England, options include Sky News and LBC. In Australia, options are ABC, SBS, and Seven Network). "How is the stock market doing?" "How it the [stock exchange name] doing today?" "What's the stock price of [company name/stock symbol]?" "What's the market capitalization of [company name]?" "Compare [company name/stock symbol] and [stock exchange name]"
"How do you say [word/phrase] in [language]?" "Where can I get [cuisine type] food?" "What time does [store/restaurant/etc.] open/close?" "Where's the closest [gas station/coffee shop/business type]?" "What's the [percent] tip on [dollar amount]?" "What movie won [award] in [year]?" "Who was the [number] president of the U.S.?" "What is [currency][amount] in [currency]?"